When I was a caterer, Brie Cheese in Puff Pastry with Jam was one of my most requested hors d’oeurve or appetizers for parties and wedding buffets. Brie Cheese is a creamy cheese that is covered with a rind. The rind is edible. You can test the creaminess of the brie by pressing on the cheese. The younger the cheese is, the creamier it will be. Puff pastry is usually purchased in a package of 2 rectangles and then rolled to the size that you need. Use one rectangle to wrap the brie and one rectangle to cut out a decoration for the brie if needed. 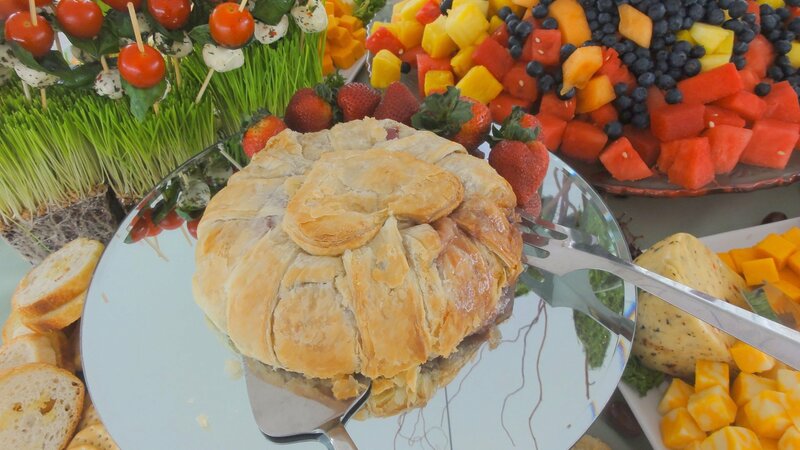 Brie Cheese in Puff Pastry looks beautiful on buffet tables surrounded with strawberries, fruits, and cheeses and other hors d’oeuvre. The acidity in fruit enhances the taste and creaminess of brie cheese. Most often I will use strawberry jam on top of the brie when I’m planning to surround with strawberries. I have also used orange marmalade to top the cheese. Set up the buffet with the cheese on a taller platter and the fruit and vegetables lower or surrounded on a platter. 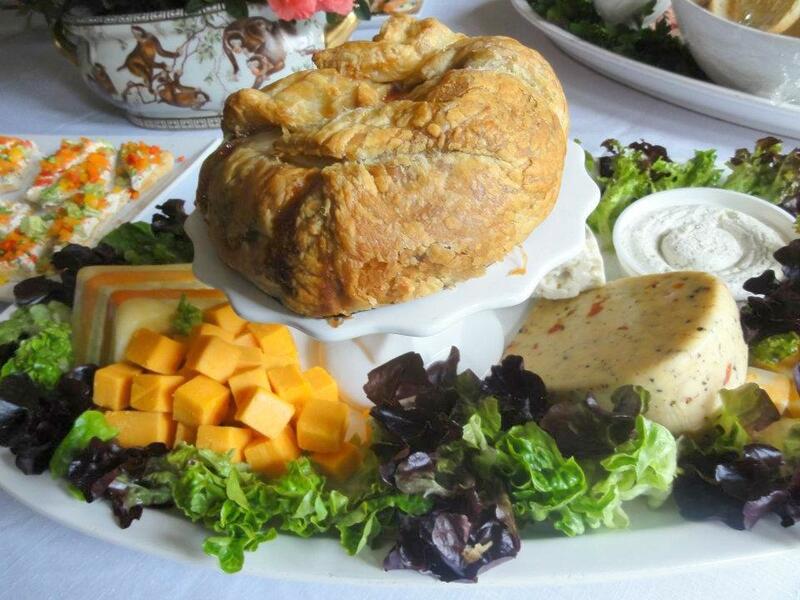 To make the display fancier you can display the brie cheese in puff pastry on a mirror. Coat the top of brie with strawberry jam. Let puff pastry come to room temperature and then roll out one of the rectangles so that it is about 4 inches bigger all around the brie. Place brie with jam in the middle of rolled out puff pastry. Bring edges of puff pastry up around the brie and overlap and ceil. With the second piece of puff pastry make a decoration for the top. hearts, shamrocks, or flowers are option. Place on top of the brie enclosed in puff pastry. Whip egg and then brush the puff pastry with egg. Place brie in puff pastry onto baking pan. Serve on a platter surrounded by fruit and crackers. Oh this sounds interesting. I love the idea of using strawberry jam too. I can see how this could be a top request. Do ppl just slice a little piece? Thanks Renz. Yes people can slice it themselves. Gives them something to do. Plus some people want small bites and others want large pieces. Brie wrapped in puff pastry and baked is so good. I have had it plain and with jam. I do think I prefer it with a little strawberry jam...or fig preserves. Thanks Pam. I've never had with the fig preserves but thanks for the suggestion. I can see why this was a most requested dish! I want to dive right in! Thanks Stephanie. It is a good one! I've had baked brie before and love it. Never tried Jam thought sounds like an interesting twist. Can't wait to try. The jam under the crust of the phyllo comes oozing out when it is cut. Delicious! What a lovely idea for parties. I bet it is irresistible! Thank you Catherine. It is a popular appetizer! Brie in a puff pastry crust? Yes please! Love this recipe! Thanks for the delish share! Thanks Handy. Makes you want to have some brie soon! Ooh yummy, I have never seen Brie served like this. Must give this a go soon! Omg this is so decadent I bet there are no leftovers... ever. I want to try this when I entertain this summer. So easy but impressive. I hope you do try it Maren. Your guests will love it! Wow Linda, I've always wanted to try this. You've given my the little nudge I needed. I love the way you plated it too, plus your presentation suggestions. Thank you Karen. The plating is important and it was always a hit when plated like this. Such a classic and a great surprise for entertaining at home or even to bring toa party. 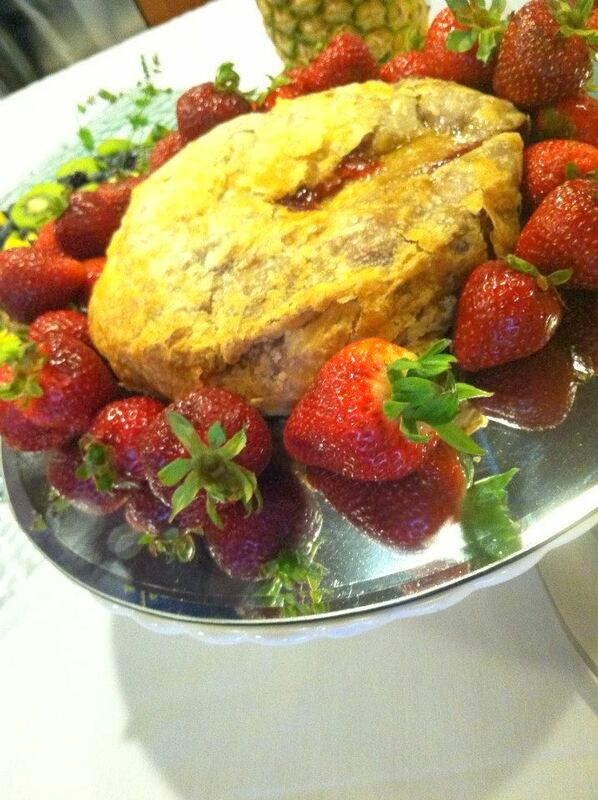 I love brie cheese wrapped in phyllo dough and fruit preserves yummy! I agree and it's delicious! This looks so yumm and I love using brie in baked puffs. This would make a great appetizer with Wines or a dessert in summer parties. Saving the recipe to try later. Thanks Molly, Great idea, your guests will love it! There's no way a party can fail with this appetizer on the table! How pretty ... and you know it's delicious!! Thank you Noel. It's true and makes a great presentation! Wow that looks delicious ! Beautifully served with fresh fruits! Thank you Priya. Nothing better than fresh fruits with the brie. I will never say no to puff pastry but include brie along with that and it's a double YES! Your appetizer looks so tasty I could make a meal out of it. I think I'll have to make an appetizer just for Hubby and me. Thank you Marisa. I want some also and haven't made it in a while. I love brie, and was gutted I could not have some when I was pregnant. Christmas time was tough, since I so wanted to have a cheese board. These appertizers look delish, no wonder they were so requested, they make the ideal treat, and such a posh one. Thank you Daniela, I love brie cheese also and it is so good prepared this way.